Saint-Gobain Performance Plastics introduces Bio-Simplex™ Polypropylene Carboys with EZ Top® Caps and single-use EZ Top® Assemblies for advanced liquid handling and solution storage for many pharma applications. Saint-Gobain offers four popular sizes of carboys: 5 L, 10 L, 20 L and 40 L manufactured from high quality polypropylene, which is resistant to chemicals and heating up to 275°F (135°C), and allows sterilization for use in pharmaceutical and clinical applications. The carboy's body includes design features that allow the user to easily hold, lift, fill, and pour while the versatile EZ Top cap technology provides interchangeable and leak-proof top connections. The Bio-Simplex carboys are available with or without an autoclavable spigot. They also feature easy-to-read certified graduation marks with ± 5% accuracy, large molded marks for clearly identifiable volume and material. The Bio-Simplex system–carboy, cap, and spigot is autoclavable. 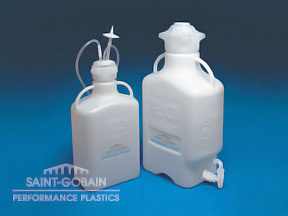 Bio-Simplex™, EZ Top®, C-Flex®, and Sani-Tech® are trademarks of Saint-Gobain Performance Plastics.